"Where are the rapids?" I asked my flight neighbor, immediately realizing it was probably a tiresome question for a Grand Rapids local. "We keep them inside on weekends," she joked, later explaining that the rapids of the Grand River (like St. Anthony Falls in Minneapolis) are long gone, but the name just stuck. When experimental pop-up Michigan House invited me to spend a weekend with them in Grand Rapids, I jumped at the chance to explore a new Midwestern city with guides (Jamie, Ted, Peter and Bethany) who already felt like friends. Internet friends, but still. I arrived knowing far too little about this city, but I wound up totally falling for the place, the people and my new blogger mates who flew in from all over the country. Here are a few highlights from this wonderful weekend, in case you care to approximate this adventure yourself. And even though hand (and hat) models this good can't be replicated, I'm sure your own friends will do nicely. I'm legitimately sad this restaurant isn't in Minneapolis next to my house. Get the breakfast burrito or the huevos divorciadas, and then stand on top of a table like a lunatic to achieve this super casual brunch picture. Do not skip the guac. It's the vegan restaurant you take your non-vegan friends to and they're like, "Yeah fine, this is actually alright." I'd recommend the warm kale salad, taco bar and the mac and cashew cheese. Sounds like it wouldn't work, but it does. It's hard to make a French macaron (I know this from seeing nine-year-olds attempt them on Master Chef Junior), and these are the real melt-in-your-mouth deal. The atmosphere at this East Hills family business is just as light and airy as the desserts, which come in creative flavors like pistachio, nutella, cassis and yuzu. Terra is one of the many Grand Rapids restaurants committed to supporting local growers and sustainable food systems. They offer wood-fired pizzas, sustainable seafood, local beers and a very popular brunch on weekends. I had the pork belly hash on Saturday morning, which was wonderful... but the breakfast pizzas scattered around our table looked even better. Anyone who has lived in southern California for even a short time becomes a little snobby about tacos, so (even though I try to keep the snobbery in check) I honestly didn't have the highest expectations for this little gas station turned taqueria. It looked authentic, but how would it actually taste? I was happy to be put in my place by the chorizo, lengua and nopales tacos. These unassuming tacos have a cult following in Grand Rapids — because they are super cheap, super fresh and super tasty. I can't imagine going to this place sober. It's one of those after-bar experiences you might easily forget if you didn't wake up to searing heartburn and Chicago dog breath in the morning. Needless to say, I have no photographic evidence of this hot dog. It's a bakery inside an Dutch windmill and the owner's given name is Jason Kakabaker, so just try and show me something cuter than that. Jason is a Cupcake Wars alum who focuses mainly on custom desserts, but you can always stop in and pick up something sweet without having to call ahead. I'd bring my laptop to this coffee shop every dang day if I lived in Grand Rapids. Apologies to the owner for holding a 20-minute photo shoot in your store like a bunch of goons, but you've made it too Instagrammable to resist. Yet another craft coffee shop with fantastic vibes, Madcap was right downtown near our hotel and one of my last stops before heading to the airport. It's a pretty well-known and popular roaster in the city (and even outside the city) and they've been brewing up good things since 2008. Sometimes when I visit a city, I wind up at the craftiest cocktail bar when I really just want to be at a normal, neighborhood bar. The one I'd frequent on Friday nights if I lived in that place. The Meanwhile is in the latter category — super chill, dark, cheap, somewhat divey and hammerhead shark-friendly (there's one behind the bar). While we were at The Cakabakery, the guys from the Direct Trade Coffee Club hosted a coffee demo with some of the seriously sweet new craft coffee gadgets that Kitchenaid just debuted (like this pourover contraption, this burr grinder and this siphon brewer). It was there I drank the best nitro cascara cold brew of my young-ish life. Even if you don't have a chance to enroll in coffee school like we did, you can still join the DTC Club for a monthly supply of beans from the Las Rosas Farm in Huehuetenango, Nicaragua. It's a subscription box you can drink! Grand Rapids' claim to beer fame starts with the consistently award-winning Founders, so you have to go when you're in town. Thems the rules. DANCE. PARTY. Half of Grand Rapids seemed to be here on Friday night, and we all danced hard. This cidery, run by John Behrens and Megan Odegaard, was my favorite part of the whole trip — not just because it was such a beautiful place (a photographer's playground), but because of the story. John's family was about to sell this Hudsonville farm that had been in his family for 150 years, and he thought that was absurd, so he bought it instead with an aim to preserve it. John and Megan began restoring the buildings, reviving the old orchard and brewing German-style ciders using local apples from nearby farms. Eventually, they launched Farmhaus, which is now distributed regionally. I drank it all weekend and approve. They opened their farm tap room the day we visited, so we were lucky enough to be the first official guests on the property. Considering how far they've come in such a short time, I'm so excited to see where this couple takes this business in the coming months and years. I'd seen Hunt & Gather all over Instagram for months, and this perfectly styled vintage furnishings store lived up to the picture I had of it in my brain. They recently moved into this industrial showroom and have created several mid century-inspired home vignettes that change depending on their stock. We kicked off our Michigan weekend here with a styling challenge using Hunt & Gather's inventory (my team won, holla) and coloring break with Escape Artists grown-up coloring books. And there was a dog. Best morning ever. If you're looking for Michigan pride, gifts and home goods, Rebel is a necessary stop. There are also a few other vintage and antique stores in this neighborhood that are worth a look, although we found them to be a little pricey. The Grand Rapids-based shoe company CAT Footwear helped sponsor the weekend and generously hooked us up with new kicks and they hosted cocktails for us in their office's lavish vault (a relic from the building's previous life as a bank), but they did not pay me to say this: I've worn these black leather boots almost every day since I got home. I love them and their comfortableness. And these warm, fleeced, vintage-y boots will likely be an integral part of my 2015-2016 winter uniform. I've also been considering these classic short boots because they looked so great on the other ladies and they come in a ton of different colors. Should a hotel be in the doing category? Yes. Sleeping is a verb, you guys. I've had the pleasure of staying in some pretty nice hotels, and this one was one of my recent favorites simply because the bed was that comfortable. And the room had ample outlets for charging my arsenal of electronics, and there were friendly people everywhere. If that weren't enough, the picture below was the view from my room. Each fall, Grand Rapids is legitimately invaded by art. It's everywhere — on the streets, in the shops, in temporary art spaces. Obviously, not everyone who visits will have the opportunity to check out this amazing month-long, city-wide exhibition, and that's a shame. People flock from all corners of Michigan (and the planet) to experience this really unique thing. There are so many participating venues showcasing art that it's hard to figure out where to start, but Site:Lab was a favorite among our group. Every year Site:Lab changes locations, and this year took over a small group of clerical buildings and houses that will soon be a Habitat for Humanity project now that the exhibits are over. One of the winning 3-D entries, "Higher Ground," was located here — an eerie hot pink house with stone-faced women in white dresses swinging at each of the windows. We also explored the ArtPrize Hub, where last year's winning light/shadow installation is housed, and a few other exhibition spaces downtown. The GRAM's curator kindly took us on a tour of the museum, highlighting the ArtPrize pieces along the way. I especially enjoyed the intricate embroidery and stitched works and the amazing finger-painted corner that still blows my mind weeks later. I don't physically understand how it could be possible to create something so large and symmetrical by hand, and yet there it is. 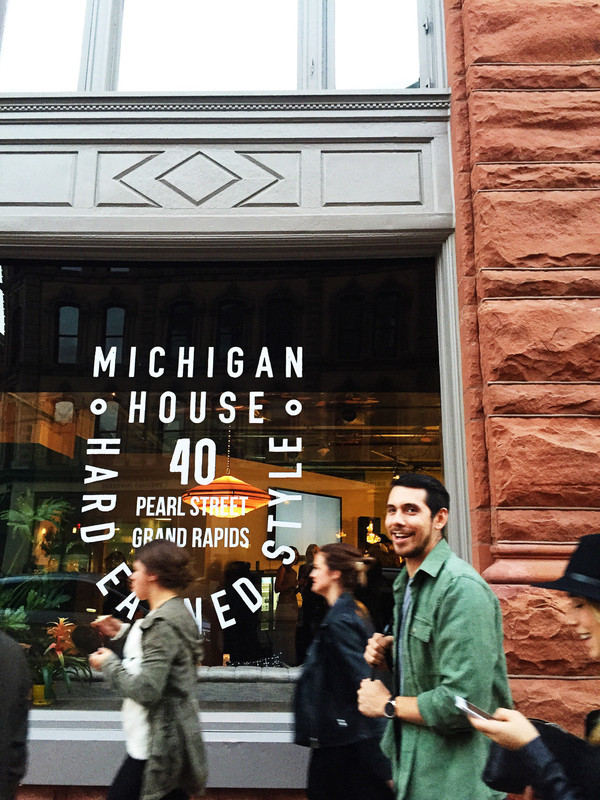 Michigan House is a roaming state-pride fest that first popped up in SXSW last year. It's organized by the same small and mighty crew that organized this whole trip. This second Michigan House pop-up in Grand Rapids was on the organizers' home turf, so it was really cool to see how it came together and the palpable support they have from the local community. During ArtPrize, they hosted all kinds of different concerts, speakers, workshops and dance parties (with chalk stomping) in the space — rumor has it they are headed to Detroit next. This weekend was certainly a whirlwind, but I know there's plenty of Grand Rapids that I didn't get a chance to see. Anything you recommend for next time? Thanks so-so-so much to Michigan House, Shop Middle West, CAT Footwear, Experience Grand Rapids and so many others for sponsoring this trip and introducing me to this wonderful city. Can't wait to come back and hang out again!